The thing is, trains are actually not designated by the MTA in a way that most people think. They actually get their names based solely on the last 3 digits of the contract. This is how I always knew what the train number was going to be when people used to make guesses at it all the time. People would always ask me how did I guess it right. Well, my secret is I never had to guess at all. It’s always been in plain sight years before the train comes out lol. Many rail buffs know this now, but the vast majority of people do not. When did the R-type series cars start having the 34 in front? I have heard a rumor– no idea whether it is true–that the 34 was added to rolling stock contracts later on, with the cars still being referred to without them for consistency. I have been the pioneer of many successful programs, from Metrocard changes, getting New Glyer back in NYC, getting Nova back in America, SAS, to SBS and beyond. In the process, 90% of what goes on within all agencies of the MTA comes across my desk before 98% of MTA employees actually get the information. For those that didn’t know, the $1 charge for new MetroCards, and making them refillable was my idea. The report I summited on what would do if I was the CEO of MTA has actually been implemented across the board. The only plans I had in there that fell apart was the order of new RTS buses, and a subway under Utica Av that stretched from Kings Plaza to LaGuardia. MTA started both programs. MTS couldn’t meet the terms for new RTS buses, and realistically they can’t afford a subway under Utica. I then suggested a diversion of that money to restart SAS. Now phase 1 is complete. I’m also changing the name of the R188 thread and integrating the R142 upgrade information. Please standby for that. This program has been in the works for nearly 2 years now. It just hasn’t been public. I did however break the story in it in a thread somewhere. I will try to find it. I may start a new thread because the upgrades will now expand to the entire 142/142A fleet. MTA is actually seeking out any and ALL companies with knowledge in train rebuilding to consult on the project. Ideally they would have had Bombardier at the forefront for this project, but they aren’t confident in their work at this time. We will get into all these juicy new details as soon as I finish the report. Back on topic. 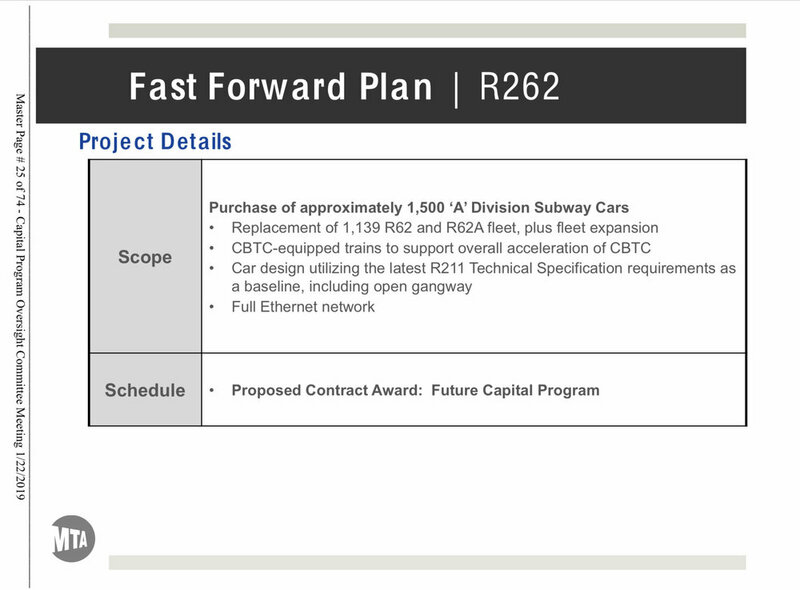 Now that the R262 is public, my full program report is coming soon. Thank you again so much for all the hard work that you do for us railfans, and for the transit system. I did not know about the specific contributions you have made. I look forward to hearing more about the R262s! This project will fund design to purchase 1,178 railcars for operation on the A Division under Communications-Based Train Control (CBTC). The purchase will allow normal replacement of current fleet and provide additional cars to accommodate ridership growth. Construction will be addressed in a future capital program. This project will fund design to convert 1,030 A-Division R142 railcars to enable them to operate in a Communications-Based Train Control (CBTC) environment. The purchase of the CBTC equipment will be funded under a separate project. Construction will be addressed in a future capital program. This project will fund design to convert 220 A-Division R142A railcars to enable them to operate in a Communications-Based Train Control (CBTC) environment. The purchase of the CBTC equipment will be funded under a separate project. Construction will be addressed in a future capital program. Guess they really will be doing 6-car sets for the Shuttle, explains that 1,178 number. Does anyone else think that they'll give the , or the R188s from the and give the 7 cbtc equiped R262s? Nah, because the uses 11 car trains where's the and use 10 car trains. 1178-1160=18, which can be three 6-car sets for the shuttle. I still don't quite get why they're going with 6 car sets when you can just use 5 car sets and swap sets with other lines as necessary, should the situation arise. The only way the 48 could really make sense is if all 3 tracks remain open (using 18 trains at a time) or the MTA decided to revive the abandoned southbound express track after rehabilitation. That would add another 6 car set during peak times and with this plan half of all 6 use sets would be in service. *Including the wrecked car from 1995. **-The active R-62A fleet is now at 820, not 824. But seriously, the actual quantity that arrive have historically been one for one. It depends mainly on the schedule needs, cost and available capital monies at the time the contract is let. Usually. all are subject to later adjustment as circumstances (and actionable options) allow during the duration of contract life. The only way to really insure accuracy is to have a crystal ball that gives you a vision of the city and the NYCT system in the late 2020's. Another factor here is the barn upgrade that will be necessary at Livonia for NTT equipment on . Presumably 240 will lean on 207 Street Shops for larger scale SMS needs. I wonder if the train crew would bother setting up the AAS on the 262s that end up on GC shuttle, would just seem easier to make manual announcements. The program already exists on the R142's and Annie Bergen does them...the only thing I'd wish they do is change the first announcement to say "This is the 42nd Street Shuttle". I know, I heard it before. Just because it's there doesn't mean the train crew will use it. I would imagine it would be annoying to set up the AAS on every trip. In my honest opinion, I would run the R62As on the till they die. I don't see the need to scrap Livonia's R62A's since the line it only has two stops. I can see R62As (on the shuttle) running along side with the new R262s. Granted, if the 62As begin to prove unreliable than yeah, give it some tech. But if the oldest R32s can run on the (the longest route) than I'm pretty sure a couple of R62As can do the (the shortest). Although the 42 St is only two stops, remember that it’s R62As see heavy usage every day and it’s completely underground. I hear you about that, but at the same time is completely underground and its using R32 and R46s which are much older than the 62As. Now yeah, the is heavily used so those doors might need some work on it but overall. Many subway lines are using old car types underground. Half of the is underground and has a good amount of R46s, The is completely underground with R46s. And the is mostly underground with R46s and R32s. So to me, those 62As have a lot more life in them. The problem there would be parts. I don't see the MTA spending the money to keep all the necessary parts for an oddball fleet of 20 cars just because they're "in good shape" when everything else in the A division will be techs by that point. It's cheaper just to replace everything and keep one set of parts that works on anything than to go through the hurdles to keep 1980's era parts for just the shuttle cars and 2020's era parts for everything else, plus the open gangways (I'm assuming they'll have them because it mentioned in the fleet review) would be a benefit for the shuttle in rush hour, over the R62As. Considering that the crew already swaps roles between operator and conductor based on which direction the train is going, it shouldn't be that annoying to set up the AAS in the direction for which you're the "conductor". Yeah, forgot about the open gangway. That would greatly improve the service and overcrowding. Fairpoint. All I can say now is that the R62s and R62s better be ready for being the next work trains. When Trains are converted to work service, do they have specific procedures on how they are to be implemented. In the case of the 62s/As, would they take out side rollsigns and seats. Would they take out the gates on the front of the car to make it look like an R127/R134? They should go with 5 digits. Really wonder what prevents the MTA from putting 5 digits on trains and buses. I think they don't do it because 5 digits are for work trains. There is no need. If you had to expand the range, I would prefer going to 3 digits from 100-999.